What would the average cost per share be? With this $1.6 million investment, a total of 12,590 shares have been bought at an average cost of $127.13 per share. If the investors can manage to sell their shares at a price above $140, they will easily make a gain of $140 / $127.13 = 1.10%.This is the whole purpose of dollar cost averaging, to reduce the total average cost per share. ii) Dollar cost averaging doesn’t tend to work when stock prices move continuous either upward or downward. Dollar cost averaging is known to be a conservative investment strategy because it avoids the investors from buying when the market is too high or sell when the market is too low. Investors buying stocks on dollar cost averaging approach buy with a long term view to stock appreciation which could benefit them immensely. Also with this approach, the investor minimizes risk because he is not stuck with too many shares bought at high prices. Another advantage is that during a bear market, more shares can be bought at even lower prices. The graph below shows the share price for each investment made from Jan to Aug 2010 and the total # of shares purchased. 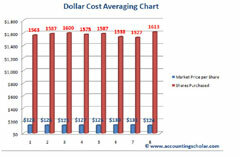 This chart shows the varied stock purchase prices between January 2010 to August 2010 with prices ranging from $128 in Jan to $124 in August.